Pagination helps you in navigating through pages on your site and has proven to be useful in sites having many articles and/or items (usually more than 30). Basically, it helps you to distribute your articles among pages by grouping them (ordered by date), and making your pages short enough for convenience of users with slow connections. Here we are going to create a Simple HTML Pagination by using PHP and MYSQL. Let’s start with creating a configuration file and then we will be proceeding with selecting records from database and rendering our pagination in footer. We are done with setting configurations related to our database. 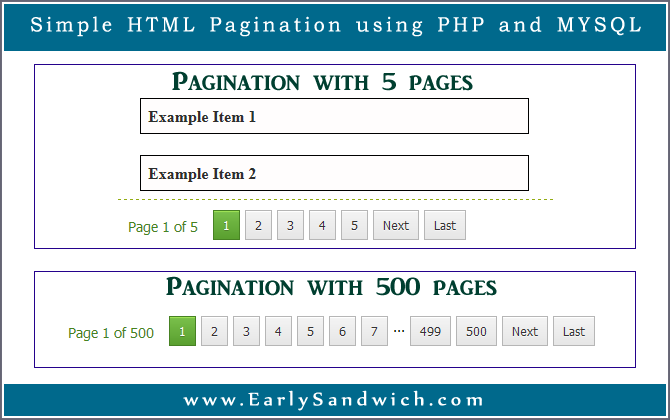 Let’s proceed with Creating Pagination Function. //putting the value of $items_per_page variable (created in config.php) into $limit variable. //defining our start point of records while selecting from db. In start we included our necessary files (config and functions) and then we moved towards getting page number from query string (in browser URL). After that we have defined range for using in our database query (for selecting records with specific starting and ending points). For example if we are on page 2 and are using 10 items per page, then our range will be from 11 to 20. Then comes our SQL query for counting total number of items from our items table in database. After getting items we stored them in another variable for later use. Now in our final query we select items for displaying in page (this query used starting and ending limits defined previously). And finally we have our records inserted into an array ready for use. And then we displayed items in their place. In the last, we used our Pagination Function which returned Pagination Output in HTML. In above PHP code, I assigned some CSS classes and IDs to HTML Tags. So after adding the above styling code (into your page), your Pagination will start looking like in the Demo. You may change this CSS as you like. Try it yourself. Also get a copy of this script’s files downloaded to your computer. Please can you tell me what issue or error is occurring. I’m having exactly the same issue. I doesn’t work for me too. I entered path to main file in $current_file_path but after clicking another page it display page without css and with incorrect records.